Future Systems' lime-green steel footbridge streaks across the dock of West India Quay, floating on its cylindrical pontoons like an insect on a pond. It was built as a shortcut between Canary Wharf and West India Quay. The bridge is 94m long overall, with a clear span of 80m. It has a low-rise profile and a tapering plan — wider at the ends than in the middle, which emphasises the perspective viewpoint of pedestrians. At night, the handrails light up and the lime-green paintwork becomes luminous. Running below the deck, the spine of the bridge is a 750mm deep U-shaped steel beam. Edge beams are supported on ribs cantilevered out from the spine. This under-skeleton supports aluminium decking and stainless steel balustrades with connecting handrails. The deck is clad with timber planks and has uplighters set into the edges. The superstructure is supported on four pairs of X-shaped tubular steel struts linked to the spine. The struts have circular footplates, which are bolted to the four pairs of pontoon floats. The 2.8m diameter steel floats are filled with polystyrene and sit transversely beneath the bridge. The footbridge was built as a bascule, with two opening sections in the centre, though it rarely opens. Its floating construction means that it could be moved elsewhere but, so far, it has stayed in the same position. To provide extra torsional resistance to the bridge spine, the pontoons are anchored to tension piles on the dock floor. 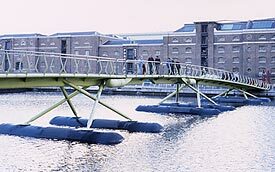 West India Quay Footbridge opened in 1996 and cost £1.7m. Its influential architect, Future Systems, closed down in 2009 after the death of principal Jan Kaplicky.